This month's free gambling system is a variation of the Parlay Repeating Dozens System sent to you last month. Last month, the goal was to parlay a repeating dozen until we were ahead for the run. Then we would reset and start a new run. If you don't have that newsletter, you can view it from the archive at: http://www.letstalkwinning.com/winalert_September2_2010.htm. This month, we will parlay repeating dozens until we win four consecutive times, cash our profits and then reset. Before starting to bet, though, we will wait for one virtual win, that is for a dozen to have already repeated once. Then we will bet on the same dozen hoping for it to repeat 4 more times. In other words, if we win our bet, we have 3 chips on the table. We don't collect them. We let them ride (or parlay them). If we win again, should the Dozen repeat again, our 3 chips will turn into 9 chips on the table. We still don't collect them, regardless of if we are ahead overall or not. Winning one more time, the 9 chips will becomes 27 and finally, a fourth win in a row will profit us 80 units (81 units (27 X 3) minus the very first chip we invested). Thus, if we have continuous consecutive losses, we do not lose anything, since we are not placing any bets until the first virtual win. As per money management, our daily target will be being substantially ahead or any time you feel you made a decent profit. In order to quit negatively, those five consecutive winnings would not have occurred for more than 80 spins up front and not later on, either, which is still a possibility. But simulations show differently. 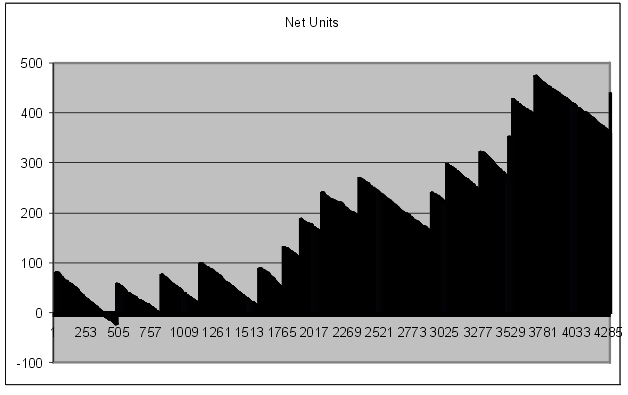 In fact, running this system over the first 4300 Zumma tester book spins of the 15,000 spins, we are able to cash 440 units, averaging about 1 unit per 10 spins, a very decent time to quit and enjoy the profits. You can see that the 5 consecutive (even more) repeating dozens occur 16 times within 4300 spins. You have plenty of opportunities to quit the use of the system, while you are still ahead, which is the purpose. At times, the repeating dozens go up to 6-7 times, but we cash our profits, after 5 consecutive wins. It could be frustrating to have 81 chips on the table and not collect them, should it lose the 6th time, although if one is very patient, one could wait for 6 wins and cash 243 chips and quit the system whenever it happens. Even the waiting for 5 consecutive wins can take time and one needs to have patience with this kind of strategy. After all, the losing of a run costs only 1 chip and the winning profits 80. So patience does pay off. Here are a few starting spins using the system until we are ahead by about 50 units. Please note that the initial winning run of 5 repeating dozens at spins 10-14 is only a coincidence. The fact that this event happens 16 times, as mentioned previously, is surely not a coincidence.